Coming November 21 and continuing through November 29, every fabric in the store will be 20% off. For the first time we will also give a 20% discount on all in stock patterns from Vogue, Butterick, McCall's, Simplicity, New Look, Burda and KwikSew. Look for discounts on trims, felt squares, and additional discounts on sale fabrics and trims. Coinciding with this super sale, we will be hosting a trunk show featuring Amy Butler's fabric and patterns beginning on November 27, and for the duration we will offer Amy Butler's patterns at a 10% discount. Come in for some great deals, and happy sewing! Just in time for some holiday gift-giving, the wonderful Rebecca (longtime Treadlette) came up with these fantastic felted fruits. On December 12th from 9-12 come in and make a personalized Pillowcase. This would be a quick project to whip up for holiday gift-giving. Serve up some fun with this easily sewn project- an apron is always a welcome gift especially in this season of entertaining! The Serve Up Fun Apron class is also on the 12th of December, from 1-3. Call the store to sign up for either of these fun classes 651-698-9690. The trunk show train rolls on here at Treadle Yard Goods, as we are currently hosting some fantastic garments from the Sewing Workshop line of patterns. These are truly artistic garments which flatter every figure and allow the wearer to show real creativity and flair! The trunk show will continue through November 29, Sewing Workshop patterns will be discounted 10% for the duration. Oliver + S Trunk Show extended! You still have a few days to come in a see these delightful children's garments. The trunk show has been extended to November 8th. 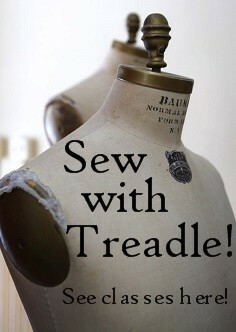 Over here at Treadle, we've been hosting the Fashion Sewing Club for a few months now, and I just wanted to let you know that another one is fast approaching. The classes are held the 2nd Tuesday of every month at 10:30 AM and 6 PM in Treadle 2 (which if you don't know, is our classroom space behind the store on Hamline Ave). The classes are run by the Material Girls (follow the link to sign up for class) and consist of a show-and-tell atmosphere to learn techniques and hear about different garments, how they're constructed and how to watch out for tricky bits in a pattern. Go and sign up today for one of these fun and informative sessions! With the nip in the air the past few mornings my mind has turned to the cozier things in life. A mug of Hot Cocoa after a long walk, comfy slippers and a new wool coat. In anticipation of this fall weather the selection of wools is growing daily at Treadle. As I looked through the newer pieces the other day I mentally planned out my fall wardrobe. A new coat surely, but add to that a vintage-inspired plaid jumper, and perhaps a skirt or two. In other news, if you have been in the store the last week you surely noticed the absence of our leader Mary. Mary is away at the International Textiles Show and she has sent back reports of many new and exciting fabrics, trims and lace. We should start seeing these goodies in the coming weeks, stay tuned! We have some exciting new products to show you on the fabric front today. The Happy Garden collection from Cloud 9 Fabrics. "Cloud9 Fabrics is passionate about bringing eco-sensible fabrics to the quilt and craft market." Cloud 9 Fabrics vows to use "100% certified organic cotton in the manufacturing of our base cloths and eco-responsible solvent-free inks and dyes for printing." Truly an admirable mission and with these adorable prints you can make a child-friendly and earth-friendly choice for your next sewing project. Our other new product is the 50% Bamboo and 50% Rayon Xotic Felt from National Nonwovens. These fat quarters are $5.75 per piece and, depending on demand, we may decide to carry their 40" wide yardage as well. The addition of bamboo makes Xotic Felt much softer in texture and drape than wool felt or even a rayon/wool blend. When I was at the store today I overheard someone say that she thought at first the fat quarters had some cashmere in them, the hand is just that soft. We here at Treadle are delighted to be able to carry these and many other sustainable and organic products, and we hope you can come on by and check them out. 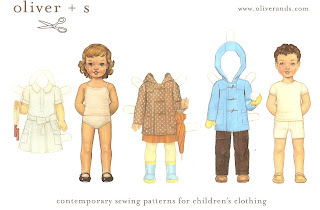 We received the newest patterns from Oliver + S today in the mail. The first pattern is the Jump Rope Dress This is a sweet shirt dress with two variations, one with a gathered skirt and one in a tunic style. The second pattern we received is the School Days Jacket and Coat. This versatile pattern can work for any weather and will suit a boy or girl. We have the pleasure of hosting an Oliver + S trunk show from October 23rd through November 1st, so stop on by to see a selection of delightful garments for children. High on my list to see is the School Days Jacket and Coat made up as a rain coat with vinyl-coated cotton. This month at Treadle Yard Goods we are happy to host the Decades of Style Trunk Show. Come in and see some of the wonderful garments from the Decades of Style catalog. This is just a sampling of the beautiful garments that will be on display through September 30th. And if you're inspired to make one of these wonderful Decades of Style garments for yourself, during the trunk show you will receive a 10% discount on your pattern.